On the run from a killer, Elizabeth Tate must accept U.S. Army captain Nick Fontaine's protection for the sake of her young niece and nephew. Now her life is in the hands of the very man who broke her heart years ago. Researcher Claire Reed's top secret project is stolen, putting her at risk of being kidnapped to unlock it. 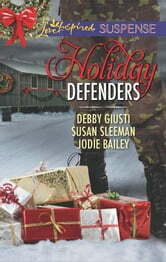 Her undercover bodyguard-her former love, Green Beret Travis Chapman-is on his most dangerous mission yet. while guarding his own heart against very unexpected feelings.